Whatever 2K Sports is paying their marketing department employees, it’s not enough. The WWE 2K games get mixed to positive reviews, but the promotion of those games is consistent, first-rate, and exemplary. Whoever makes the games’ commercials has a masterful grasp on why fans love the WWE. A huge part of the abiding love that adult fans have for the WWE is the past—what these Superstars meant to them as children. Everyone knows that the matches are scripted and pre-determined, but when you’re a kid, you suspend your disbelief even if you’ve been told, condescendingly, that it’s all “fake.” You view the WWE Superstars as superheroes and supervillains, and some of that childish wonderment carries over into adulthood. The marketing team at 2K knows this. They’ve been masterful at pushing our nostalgia buttons and making us feel feelings that we didn’t even know we were hanging on to. Their success streak started with the promotion for WWE 2K14, when they got the Ultimate Warrior to star in their pre-order commercial. This was a pretty big deal at the time. A decade prior, Warrior had gone full-on insane with the whole political motivational speaker route. Around the same time, the WWE released a hatchet job DVD titled “The Self-Destruction of the Ultimate Warrior.” No one thought Warrior would ever speak to the WWE again, let alone star in a commercial promoting its product. And yet, here he was, in full makeup, growling and snorting for the camera. He even wore his chest paint for the occasion, recalling his iconic Wrestlemania VI appearance. A Hall of Fame induction followed soon afterward. Then, for the 2K15 promotion, 2K Games got ahold of Sting. Sting! At the time, he hadn’t even wrestled in the WWE; he was the last holdout from the Monday Night Wars. And although he had appeared in a couple of WWE documentaries, this was the first time he was painted up with baseball bat in hand, ready for war. And that music. Again, a Hall of Fame induction followed soon afterward. By this point, these commercials had become a wish fulfillment for a certain generation of wrestling fans. And the 2K16 promotion did not disappoint either. These commercials featured two different nostalgia trips. The first was a reveal of the Terminator as a playable character. The WWE Superstars re-enacted the famous bar scene from Terminator 2, and Arnold, musclebound as ever, played himself. If you look closely during the visual scans, you can pick up on some cute, statistical Easter Eggs. The second nostalgia trip starred “Stone Cold” Steve Austin, who was that year’s cover star. It’s easy to miss, but that’s the custom Smoking Skull Belt that he digs out of the ground and dusts off. It even has the rattlesnake skin on the inside of it. 2K is pitching Austin as the lonely rider, going back in time to relive past glories. This means less to fans who don’t know their WWE history or didn’t grow up during the Attitude Era. No matter. The kids are buying the game anyway. But for the older fans? This was the hook that pulled us in. And now, here we are in the lead-up to WWE 2K17, and again, the marketing team is hitting it out of the park. This year, for the first time, they are are catering explicitly to the Internet and its tendency to pick apart every bit of news with meticulous intent. Take a look at this trailer, which reveals Goldberg as the pre-order character, and then we’ll talk. On its surface, it’s a badass trailer. We get a greying, but still scary Goldberg, who exhales smoke through his nostrils. We get the cop detail from his famous entrance. We get the iconic music. If one of the cops had banged on the door and yelled, “Goldberg!! It’s TIME! !” I would have cheered. But wait. Put all of that aside for a second, and take a look at the reflection in the car window. 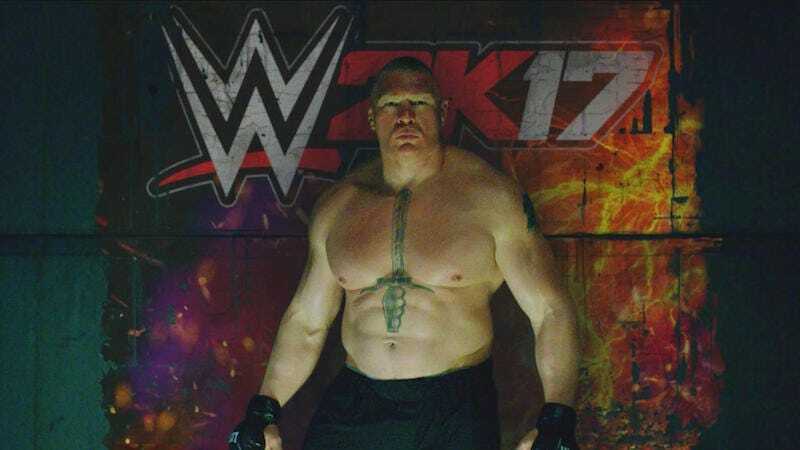 The road sign says “Suplex City.” It’s a direct reference to Brock Lesnar, who would later be announced as 2K17’s cover star. When Lesnar got his own game trailer soon afterwards, the filmmakers had kicked everything up a notch. There’s so many neat, little things going on in this trailer. Some of them only last for mere frames of film; few people would catch them on a first or even second viewing. But that’s the point; the creators are encouraging the fans to collaborate, compare notes, and break down the trailer, frame-by-frame, to find all the gritty details. Here’s what I’ve managed to find so far. The warehouse on the left says “Del Rio Imports and Exports,” a reference to Alberto Del Rio. The ferris wheel on the right says “Spinaroonie,” a reference to Booker T’s breakdancing taunt. Here’s a shot of Steve Austin’s smoking skull logo. Here’s a self-explanatory reference: a billboard for “Big Show’s Really Big and Really Tall Menswear.” The water tower to the right reads Suplex City—again, a direct reference to Lesnar. Here’s some sheep people, a reference to the Wyatt Family stable. The Sheamus reference below is obvious; that’s his logo, and the “Brogue Kick Saloon” is a reference to his finishing move. But I’m more interested in the old school fight poster that’s peeling off the wall. Does that say Alex Riley versus Elias Samson? Maybe one of our eagle-eyed readers can read more of what’s on the poster or identify the original source. One of the main problems with the 2K franchise is that they are trying to build a realistic wrestling simulator. I’m not sure, however, that the fans want or need something that is realistic, and it seems oxymoronic and self-defeating to try. Professional wrestling, by its very nature, is exaggerated and fantastical. When I play a wrestling game, I want to have a theatrical experience; this is sports entertainment, after all. I don’t need an accurate sports simulator; if I wanted that, I would play the UFC games. The 2K marketing team understands that wrestling is, at its core, a big carnival show, driven by the fans’ love for callbacks, inside references, long running jokes, and above all, nostalgia. These commercials are ridiculous, but deliberately and rightfully so. If only the 2K gameplay captured that sort of insane, “go-for-broke” excitement. Hopefully, at some point (maybe this time? ), the developers will understand this, and they’ll give us the fun, silly, wild game that fans will love. The way they loved No Mercy. The way they loved WWE Smackdown! Here Comes The Pain. But until then, the marketers are out front by a mile.